Earlier in the season I was recruited to produce a menu for a fraternity group meal or “Manwhich”. I was originally told there would be 20-30 young men at the event. Sometimes I question my own sanity. 10 racks of ribs, 9 cups of BBQ sauce, 2 kg pasta, 1.6 kg cheese, 1 lb of butter, 2L of milk, 3 packs of bacon, 29 cupcakes, and a beer. I bought this all two days before the “Manwhich”. My biceps hurt for the rest of the week. 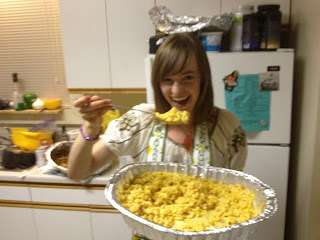 This was enough to double the recipe of BBQ sauce and quadruple the mac n’ cheese. I could only hope it would be enough. 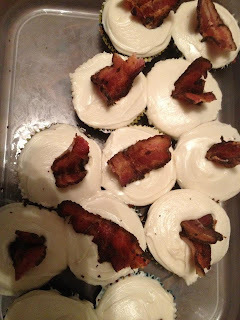 Bacon chocolate cupcakes for dessert. I had done a lot of prep ahead of time for the meal, and had shown up early to start cooking, but was still flustered. There is a lot of pressure to have everything done on time at the SAME time. Luckily I was rescued by a lovely helper, who was critical in keeping me organized, and giving me the necessary support when things went wrong. Like when I spilled dry pasta all over the stove. Or when we discovered the oven had been turned off by a phantom menace. I dare not imagine the consequences of 20 hungry male university students who have been denied a promised feast. 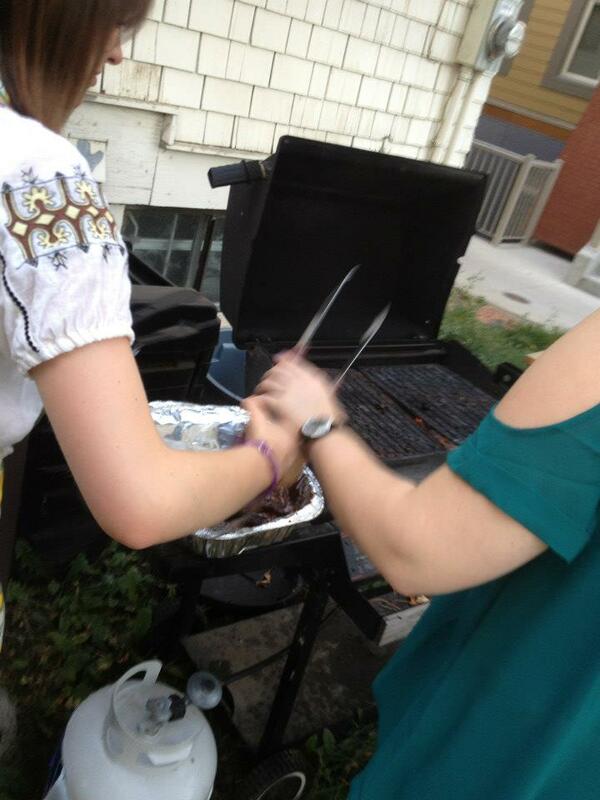 I owe my life to the barbecue, which we used to speed up the cooking process. Overall, it turned out to be a successful meal. The ego boost and the compliments were pretty good fringe benefits, but the real reward is the time I get to spend with a bunch of great friends. In a pot over medium heat, add the oil and allow to get hot but not smoking. Add the garlic and sauté for about 30 seconds. Add chocolate and spices, stirring gently as chocolate melts. Allow to cook until thickened, stirring occasionally, about 15 minutes. Grillmaster...there can only be one! Combine ingredients in a small container. 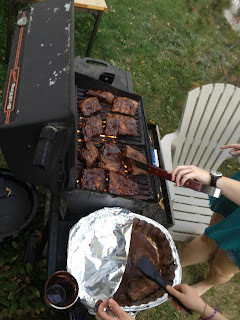 Prepare ribs by removing the translucent membrane on the inside of the rack. Apply 2 tbsps of chocolate chili BBQ rub to each rack of ribs. Place the ribs, meaty side up, on a pan in a single layer. Cover tightly with aluminum foil and place in oven. Cook for 1 to 2 hours, or until meat tears away from the bone.. Remove foil and brush ribs generously with barbecue sauce. Finish ribs in the oven by broiling for 3-5 minutes (if ribs are hot) or until sizzling and golden. Turn ribs over and repeat, basting with barbecue sauce. If someone turned off your oven, resist spanking them. In the face. With a chair. Instead, grill for 3-5 minutes over medium-high heat. Serve the ribs and leave before the marriage proposals begin.